I like bands that mislead you to think that they come way back from the 80s or even further away like the 70s – although to think again, that wouldn’t make much sense. Cleveland’s twee-poppers Bears offers saccharine sweet and delightfully light pop songs. Their tunes overflow with the delicate sounds of xylophones, bell tinkles as well as tambourines that brings life to their catchy melodies. 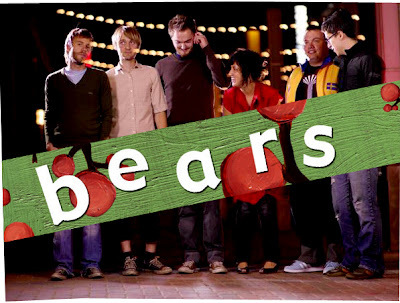 Bears create compact pop songs all through their self-titled debut of about 13 tracks in only 36 minutes; quoting from Brooklyn Vegan, “It’s the perfect record for those who have A.D.D”. Despite the lo-fi production, the tunes doesn’t fail to lose its charm while providing a stripped sound, thus creating less conventional pop songs. In the song, ‘How to Live’ there’s a faraway feel in an ancient sense. The sound - I later learnt – of Farfisa organ adds a slightly sinister remark through out the whole tune. While for other songs like ‘Everywhere’ and ‘When you’re Away’ is filled with cheeriness that’s too familiar, it's comforting.